Looks like the MAI-75 folks have scheduled some SSTV activity during specific periods each day from Dec 6-8. The times correlate to a small number of passes each day in range of Moscow. Seems the system will be put through some extended testing from Dec 5 starting around 15:00 UTC and running until 09:00 UTC on Dec 6. Test images will be used during this period. This will provide near global coverage if all works well. The MAI-75 schedule remains unchanged at this point. Transmissions in PD120 being reported by ground stations. Reports of computerized voice also reported. This is likely from a program running on the same computer and outputting audio to the headphone port that SSTV is also using. There appears to be 12 images in the series but images on 1-6 are the same as the ones on set from 7-12. 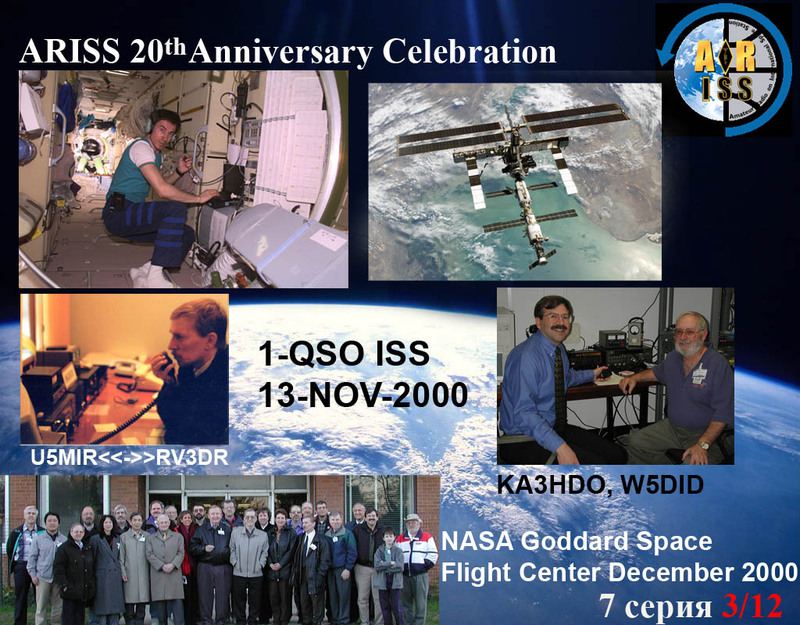 Looks like the Moscow Aviation Institute will be active on SSTV from ISS on a few select orbits over Moscow on October 13 and 14. Time frame is not yet published but should favor the time period between 08:00 and 16:00 UTC. Unknown at this time what mode will be used but should operate on the frequency of 145.800 MHz that they have used in the past. Since all of the images have now been received, here is a little description of the various photos included in each image. Descriptions Left to Right and top to bottom: 1) Sergei Krikalev and Musa Manarov aboard Mir Space Station, 2) SAREX Crew of STS-71, 3) "RADIO" magazine, 4) Attendees of first ARISS meeting in Houston, TX (1996), 5) Marquee outside the hotel for the first ARISS meeting. 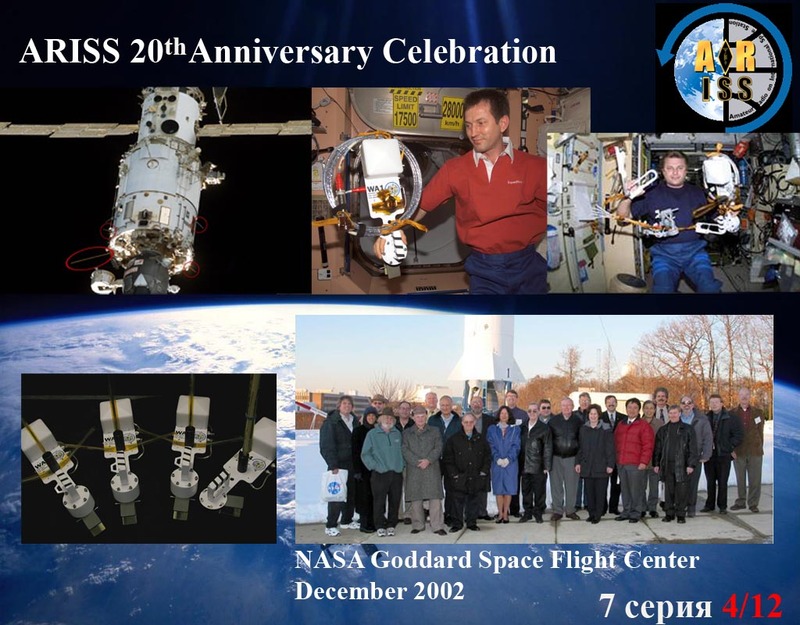 Descriptions L-R and top to bottom: 1) Sergei Krikalev in the FGB of the ISS, 2) International Space Station, 3) Sergey Samburov - RV3DR, 4) Frank Bauer - KA3HDO and Lou McFadin - W5DID, 5) ARISS meeting at Goddard Space Flight Center (2000). 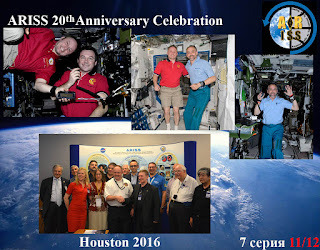 Descriptions L-R and top to bottom: 1) Russian Service Module (SM) on ISS, 2) Sergei Treschev with one of the ARISS antennas, 3) Yury Onufrienko with a couple of the ARISS antennas, 4) Photo of all 4 ARISS antennas that are now mounted on the Russian Service module. Descriptions L-R and top to bottom: 1) Pavel Vinogradov at the D700 for SSTV operations. 2). 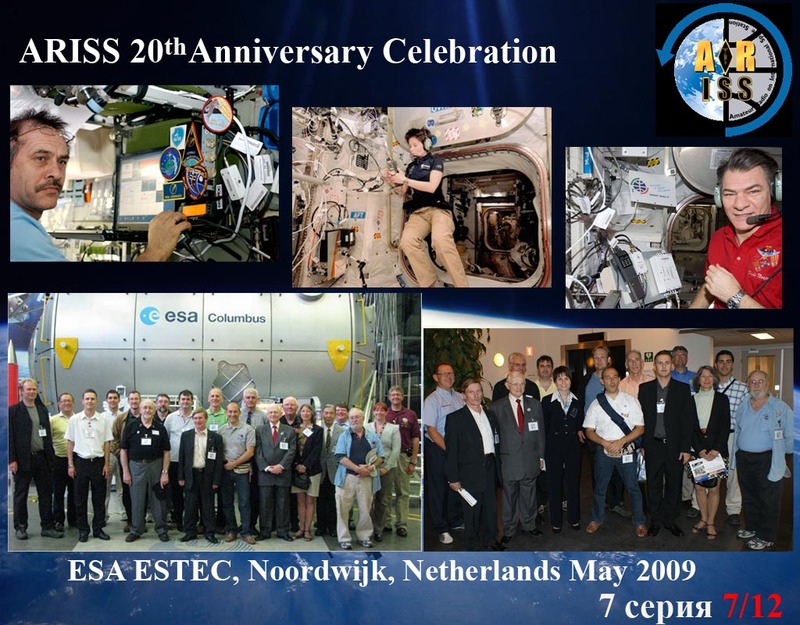 Descriptions L-R and top to bottom: 1) ARISSat-1 just after deployment, 2) Oleg Skripochka, Alexander Kaleri and Dimitri Kondratyev with ARISSat-1, 3) Received collection of 6 live SSTV images from ARISSat-1, 4) Attendees at ARISS meeting at ESTEC in The Netherlands (2014), 5) SSTV image loaded into ARISSat-1 when no earth view was present. 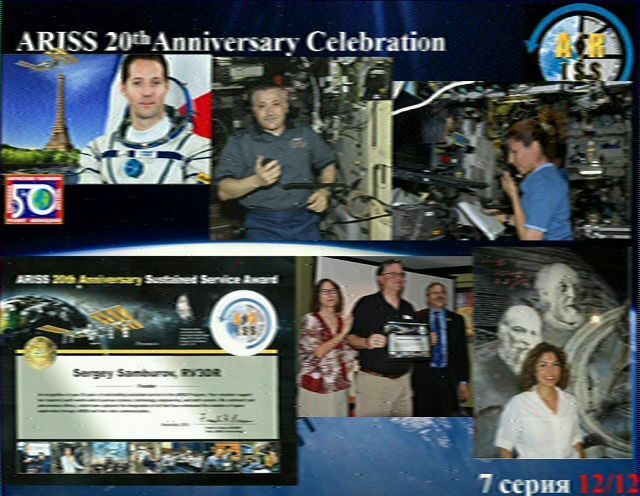 Descriptions L-R and top to bottom: 1) Tom Marshburn using the Ericsson in COL, 2) Tim Peake using Ham TV from COL, 3) Randy Bresnik installing the VHF/UHF antenna on COL, 4) Collection of 3 photos showing students talking to crew members on the ISS. Descriptions clockwise starting from top left corner: 1) Koichi Wakata at the mic of the D700 in the SM, 2) Sunita Williams at the mic of the D700 in the SM, 3) ARISS attendees at the meeting in Tokyo Japan, 4) Presentation to JAXA near their mission control in Tsukuba. Descriptions clockwise starting from top left corner: 1) Thomas Pesquet, 2) Fyodor Yurchikhin at the mic of the D700 in the SM, 3) Anousheh Ansari at the mic of the D700 in the SM, 4) 20th Anniversary ARISS support award, 5) Rosalie White, Matt Bordelon and Frank Bauer during award presentation 6) Anousheh Ansari in Moscow. The event started on time and images are being transmitted in mode PD 120. 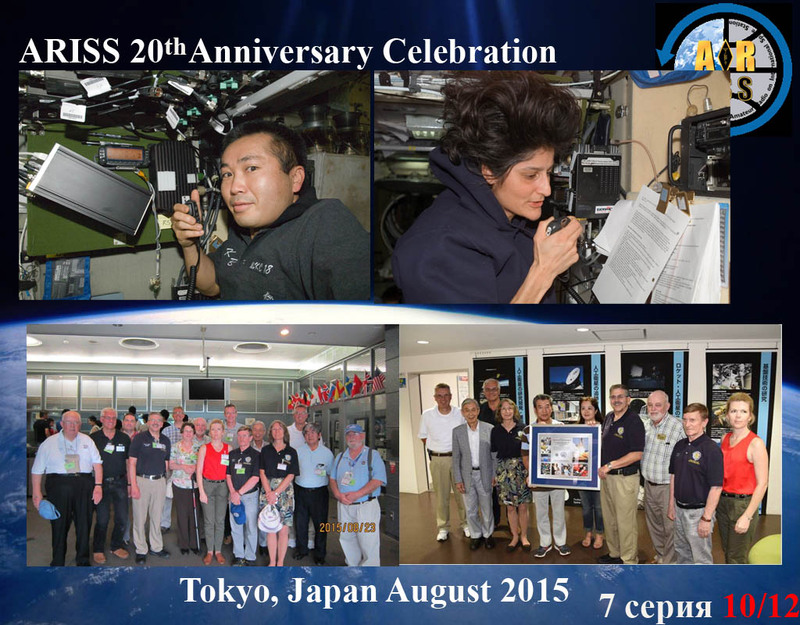 We are happy to see all the images being posted to the ARISS Gallery. We have already begun archiving some of the images received due to the vast number of submissions. It appears we may already have most of the dozen in the series. Here is #1 captured by SV2HWM. And here is #12 captured by K6VUG. Keep up the great work and be patient. YOU might get all 12 since the event is scheduled to run until 18:00 UTC on Monday, July 24. 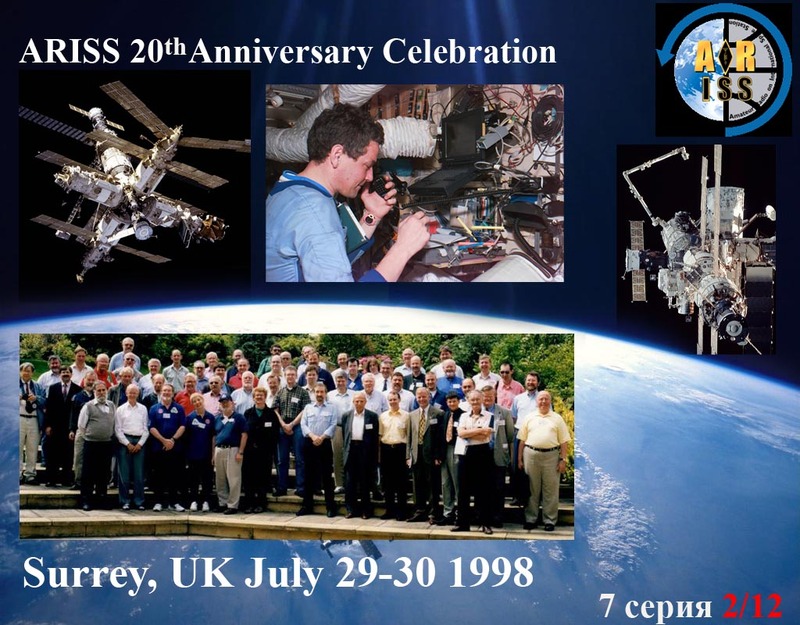 In commemoration of the 20th Anniversary of ARISS, a Slow Scan Television (SSTV) event is planned for Thursday, July 20 starting around 21:25 UTC. 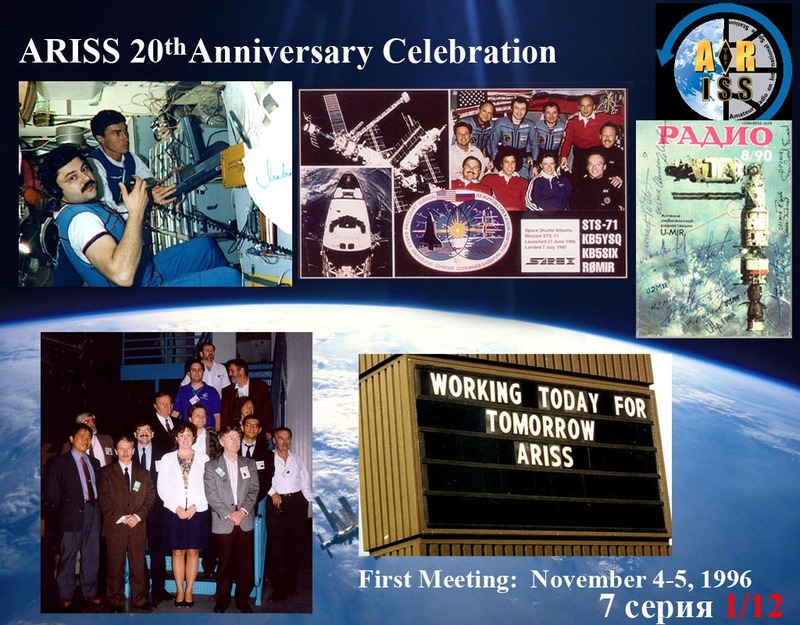 The event plans to feature images from ARISS activities both past and present. This opportunity should cover most of the world during the operation period. 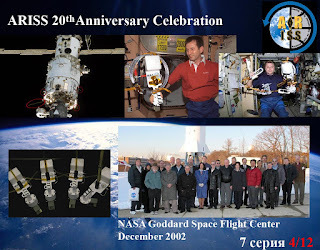 The event plans to use a computer on the ISS Russian Segment, which stores images that are then transmitted to Earth using the ham radio, specifically the onboard Kenwood TM D710 transceiver. Those receiving the images can post them at https://ariss-sstv.blogspot.com/ for viewing by the public. 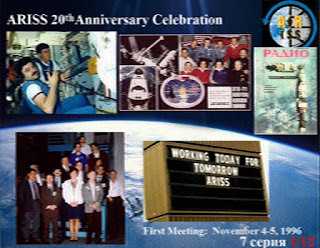 The 20 year history of ARISS will be displayed through a collection of 12 unique images sharing the amazing accomplishments of ARISS over the last two decades. 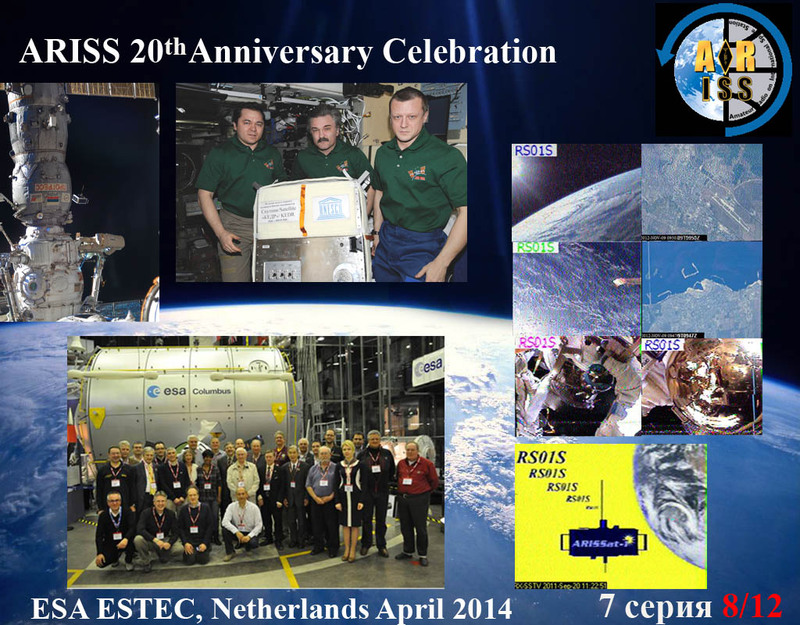 SSTV signals will be sent to earth at 145.80 MHz using FM. The SSTV mode of transmission is expected to be PD 120 (PD 180 may be a second option). The event is expected to continue over a two day period. 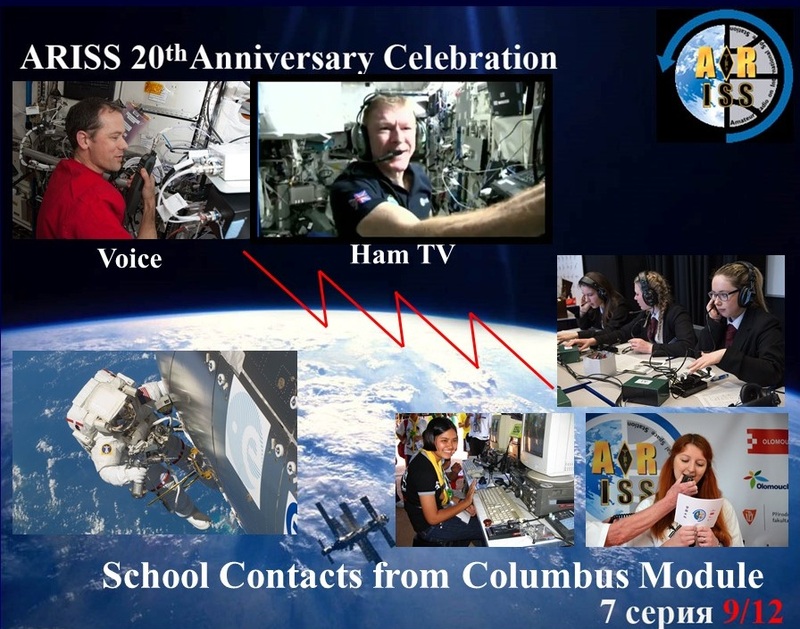 Since it’s inception, Amateur Radio on the International Space Station (ARISS) has provided students an opportunity, through ham radio, to engage in conversation with orbiting astronauts and inspired many to seek careers in science, technology, engineering and math. Consider how you might inspire students in your area through this chance to capture images directly from space to their computers. Please note that the event, and any ARISS event, is dependent on other activities, schedules and crew responsibilities on the ISS and are subject to change at any time. 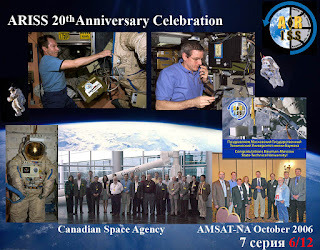 While preparations are being finalized please check for new and the most current information on the AMSAT.org and ARISS.org websites, the AMSAT-BB@amsat.org, the ARISS facebook at Amateur Radio On The International Space Station (ARISS) and ARISS twitter @ARISS_status for the latest information on this event. Amateur Radio on the International Space Station (ARISS) is a cooperative venture of international amateur radio societies and the space agencies that support the International Space Station (ISS). 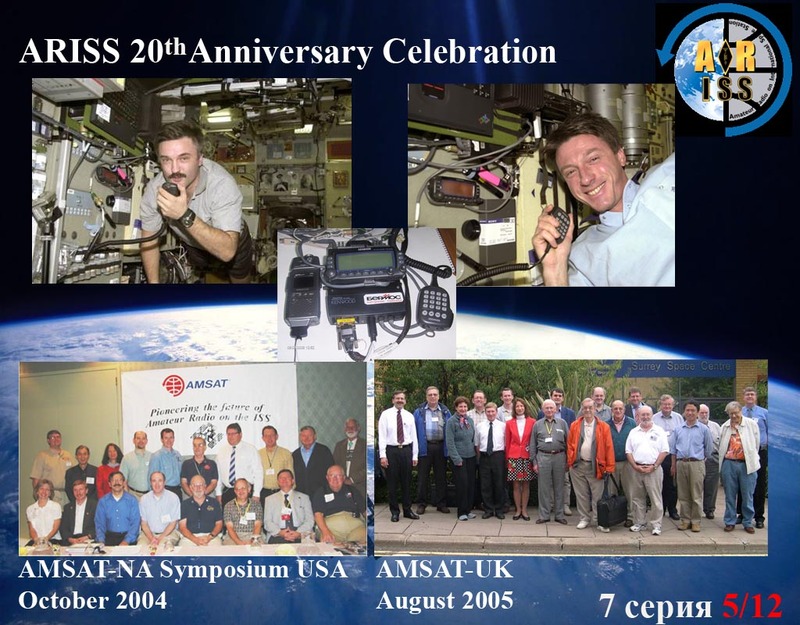 In the United States, sponsors are the Radio Amateur Satellite Corporation (AMSAT), the American Radio Relay League (ARRL), the Center for the Advancement of Science in Space (CASIS) and the National Aeronautics and Space Administration (NASA). The primary goal of ARISS is to promote exploration of science, technology, engineering, and mathematics (STEM) topics by organizing scheduled contacts via amateur radio between crew members aboard the ISS and students in classrooms or informal education venues. 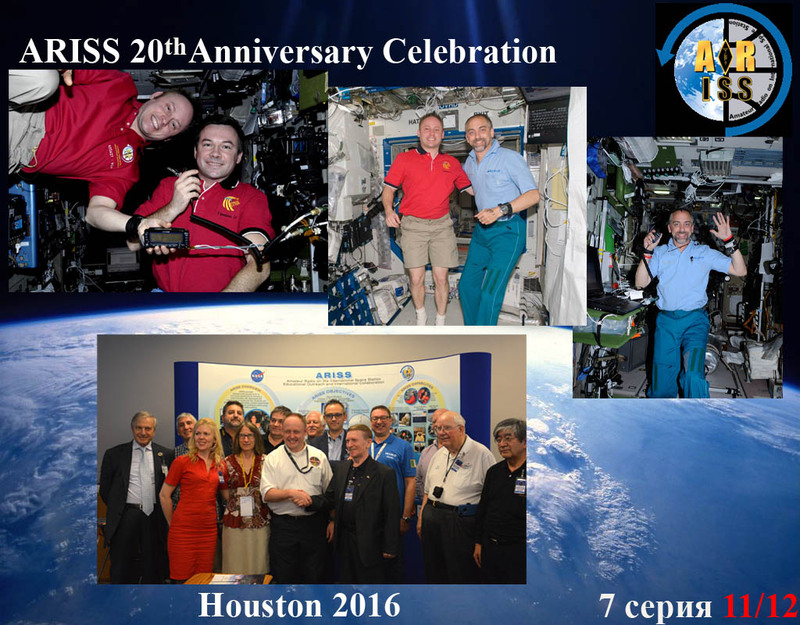 With the help of experienced amateur radio volunteers, ISS crews speak directly with large audiences in a variety of public forums. Before and during these radio contacts, students, teachers, parents, and communities learn about space, space technologies and amateur radio. 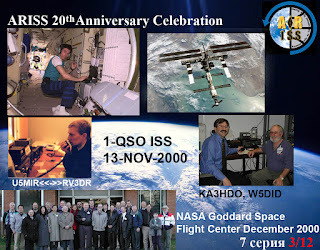 For more information, see www.ariss.org, www.amsat.org, and www.arrl.org. Starting with our first meeting in November 1996, our joint operations on Mir, becoming the first operational payload on ISS in November 2000 to our 1103rd school contact (so far), ARISS' accomplishments have been tremendous. We have touched the lives of many and inspired and educated countless students to pursue science, technology, engineering and math careers. Please stay tuned as more details on our SSTV event will be communicated in the coming weeks. Please spread the word. And think about how you can get students in your area involved in capturing these images. We would love to hear your stories on how that goes. MAI-75 SSTV from ISS planned for Monday, February 13 from 09:25-18:00 UTC and Tuesday, February 14 from 11:25-16:30 UTC. Passes are just the ones in range of Moscow. Presuming standard configuration with down link on 145.800 MHz and PD-180 (unconfirmed). It appears that the experiment is having some issues as I have seen several reports of "nothing heard" during the time that the crew had activated the system. Hopefully the ground team can work out the problem and correct it before the experiment is activated on Feb 14.